From AP reporter Margie Mason via the Washington Post. 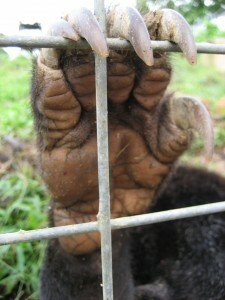 The bears were found on an illegal Taiwanese-owned operation in southern Vietnam. Bear farming is illegal in Vietnam. It is legal in China. This entry was posted on Thursday, January 28th, 2010 at 3:26 pm	and is filed under Conservation, Law and Policy, Law Enforcement. You can follow any responses to this entry through the RSS 2.0 feed. Both comments and pings are currently closed.